A native of Columbia, S.C., Dr. Lakeyta Bonnette is a Political Science professor at Georgia State University. 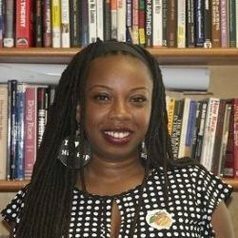 Her research interests include popular culture, political behavior, black women and politics, political attitudes, African-American politics, political psychology and public opinion. Dr. Bonnette completed her undergraduate studies at Winthrop University where she attended the Ralph Bunche Summer Institute at Duke University and the Ralph Bunche Summer Humanities Institute at the University of California, Los Angeles. She is also a member of Delta Sigma Theta Sorority, Inc.
Dr. Bonnette completed her doctoral degree in the Department of Political Science at The Ohio State University. While there she began initiatives such as the Hip-Hop: Behind the Music Conference, served as coordinator of Sisters for Success, and served as President of the Black Graduate and Professional Student Caucus. Dr. Bonnette has completed numerous research and presented various papers in her field of study on topics including the political effects of rap music, black ideology and political rap music, the black church and black women and Black Nationalist views. Dr. Bonnette currently teaches classes on American government, Black women and politics, Black political behavior, Black politics, Hip-Hop and politics, and popular culture and politics.